Seasoned actor Arthur Leander, begins this stirring, dark apocalyptic tale, (fusing both melodramatic and darkly humorous elements),standing on a stage at a Toronto Shakespearean theater production, arrayed in the uniform of the tragic Shakespeare character of King Lear, looking outwards onto all the dazed, enthralled faces of the audience watching what will be the final production for the both the life of Arthur, civilization, and any production of Shakespeare performed in an orderly, symmetrical society (with fixed structure and security). His performance is interrupted, unpredictably, by a sudden stroke.In this initial dramatic scene of the story, his erratic pendulum swing from presenting the life and ambition of a Shakespeare actor suddenly smothered by the menace of death is a very rich, excellent simulacrum of that same oscillation between life and death that swings wildly and incessantly throughout the heart of this rich literary work, about the apocalypse, in Emily St. John Mandel’s story. We are swept from the dazzling spotlight aimed at the center-stage of the life of an actor; the heart of an infamous Shakespeare play; and into the apocalyptic afterlife that follows his tragic death. For the rest of the tale, we are left with a somber reflection of life and death, the impact one person’s life has on the unfolding patterns of future lives, even though the story ostensibly also acts primarily as a survival story, an account of humanity’s ability to endure the miserable gloom and degradation of a society after a virulent viral outbreak ravages civilization as a whole. This story functions on so many different artistic levels, without the author having to be so didactic about describing these mechanics, because Emily St. John Mandel has a strong grasp of the post-modern literary art of pastiche,or the expert weaving of so many disparate genre elements (or types of stories). This is a story of human’s survival, the paradox and legacy of a famous Hollywood actor, the characters living in the shadows of his death (trying to find their own life’s purpose), all wound together neatly with mesmerizing, sublime prose that has been woven together with so much use of the art of subtle writing. It is never overwritten, and it allows enough artful pause over certain segments so we can ponder the meaning of our lives. More than survival, the heart of this novel is the endless, sometimes labyrinthine search for meaning in life. How do we keep ourselves from being bogged down by existential dread, or the strangling sensation that overtakes us, when we begin to ruminate over this central question that haunts Shakespeare’s tragedies (this novel is a literary model of all the dramatic features of a Shakespearean tragedy in many ways). We fret constantly, just like one of the characters in this book, whether or not we’re really ghosts, mindlessly wandering through the dead catacombs of life.. Emily St. John Mandel’s writing of this exchange between one of Arthur’s friends Clark, and another client for his business (an ironically sedate type of arrangement, given the nature of the exchange) mulls over this core consideration, and philosophical quandary of the story. It is the same thing that haunts the famous Elizabeth Bishop poem, entitled The Man Moth, which talks about the contradictory spectral nature (in a metaphorical sense) of the way some people take their lives for granted, or don’t see each day as a daily, recurrent miracle that we have one more blessed day to live our lives to the fullest extent possible. Sometimes, life though makes us get burned by the bright lights of dauntless passion and ambition, much like the way the title artist in James Joyce’s Portrait of the Artist as a Young Man, finds himself tumbling, tragically, back to after being burnt by the existential wrath (or recriminations) of the human psyche. This is the same burning sun of how our own societal ambition to grow and expand our corporal structures, and our accelerated technological/scientific advancements will cause us someday to be Icarus, who will face the wrath of the amorality of nature or the inevitability of apocalyptic events. To think,that a novel that explores all these multifarious elements of existence and the creation of art, has one central image, at the beginning of this novel, that richly tells the entire story in one dramatic frame of the last performance, of an aging actor, acting out his final scene as the tragic character of King Lear. And to think, this novel only continues ever-the-more in your mind, as any thoughts prompted by reading this dizzying, somewhat melancholic dream of this novel continues the story in your mind. 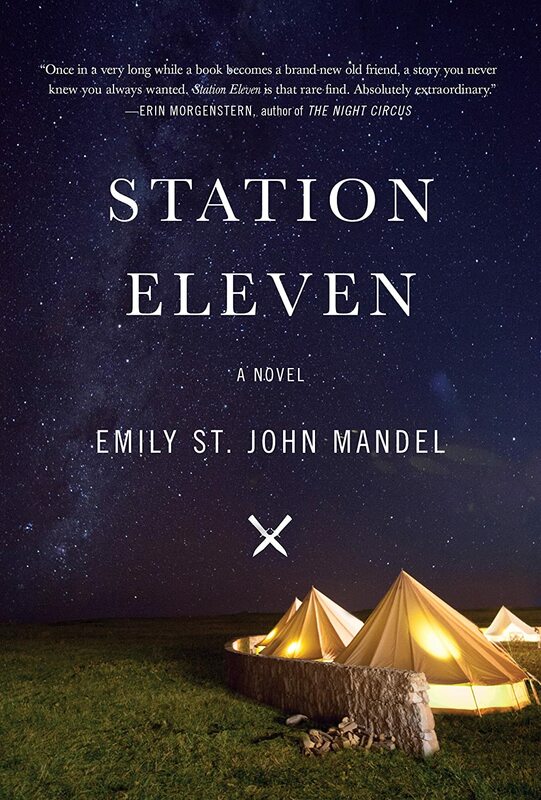 Station Eleven is a beautiful apocalyptic novel, encapsulating the strife and vicissitudes of life, all within a delicately shaped apocalyptic nightmare, which will deeply affect even the most hard-hearted and cynical of readers. To further promote the perfect pairing of tea and books, here is a special literary tea recipe, inspired by reading Station Eleven! 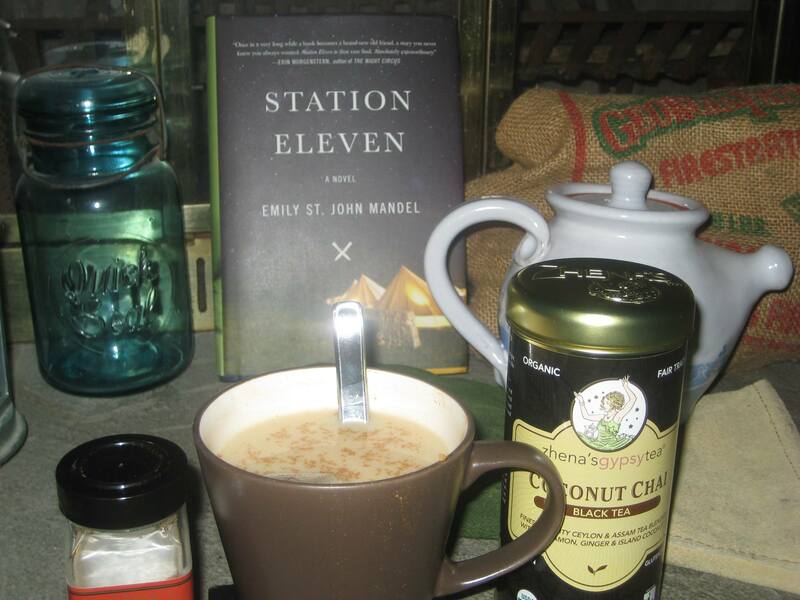 This is the tea that comes the closet to casting a strangely calming pallor, in the minds of any readers, mystified by the dazzling imagination of Emily St. John Mandel’s Station Eleven.